Melissa finding a letter in her locker inviting her to meet the mystery kisser in the darkroom after school. Josh catching Cody and Melissa in the dark room. Melissa realising Josh must have seen who the phantom kisser is! Josh mutters that the guy's a creep, and he storms out. Melissa tells Cody that she‘s got a button from the phantom's shirt from when she grabbed him to stop him running away. Cody replies excitedly that they just need to match it to the right shirt and they have the phantom kisser! GEMMA: In that case, come on in! Matt climbs through the window and reveals that he has a surprise for her – but he's decided he'd better not tell her until after her exams are finished. Gemma asks if he's booked somewhere for their holiday, but he replies that that's not it. GEMMA (smiling): Then what is it?! MATT (sighing humorously): Darling, I'm the love of your life. Have you not missed me at all? GEMMA: No... I've been too busy studying! Besides, if Aunty Madge even suspected that I was thinking of you, she'd start to growl! MATT: I'm not scared of her. GEMMA: OK, so what would happen if she walked through that door [she indicates the bedroom door] right now? MATT (indicating the window): I'd leave. GEMMA: Exactly! So perhaps you'd better leave before you get sprung! MATT: I'm not leaving before you give me a goodbye kiss! GEMMA: Are you going to tell me what my surprise is? That doesn't stop them beginning to pash anyway! Josh is sitting at a table when Todd walks in and sits down with him. Josh tells Todd sourly that Melissa has just been mauled by the phantom kisser again. JOSH (curtly): Very funny, Todd – especially now we *know* who the darkroom pervert is. Mate, I saw you running down the corridor. Todd looks astonished that Josh thinks it's him. He adds that the kisser could have ducked into one of the two classrooms opposite the darkroom. TODD (angrily): I don't believe this, Josh: you're supposed to be my best friend. JOSH: And Melissa is supposed to be my girl – but you'd never think so, the way she played around with *you*. Looking furious, Todd storms out – just as Melissa comes in. She sits down with Josh and asks what's wrong with Todd. Josh explains that he's worked out that Todd is the phantom. MELISSA: Well I'd know, wouldn't I? I mean, I went out with him for long enough. Besides, the guy who jumped me was beefier and taller. JOSH: Todd could have stood on his toes: it's very hard to tell in the dark! MELISSA: He could have been on stilts, too! Trust me, Josh: a woman can tell, and it wasn't Todd. MADGE: I don't believe this. 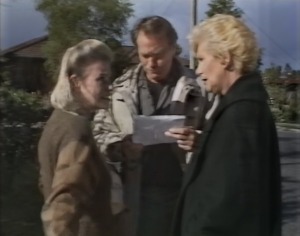 Helen tells her that she had one as well, and a check on Ramsay Street shows that the Robinson House is one of the worst offenders. She adds that Dorothy has certainly gone into this very thoroughly. 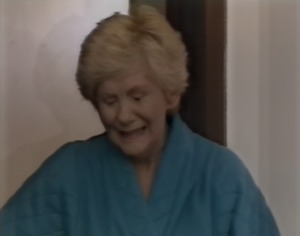 MADGE (chuckling): Oh Helen...: loose latches on the back windows... set of steps stored under the house... Naughty naughty! HELEN: Don't be too complacent! In other areas it says the Ramsay House is a total security disaster too! Doug's ute pulls up outside No. 28 and Doug climbs out. He walks over to Helen and Madge. She then demands of Doug whether he's responsible for the security surveys. Doug looks at the sheet of paper she waves at him and remarks that Dorothy has been pretty thorough. Helen adds that it would have been more efficient to just tell them where the problem areas were so that they could get on with the maintenance. DOUG: Only carrying back to Mein Führer's orders, ladies! He then goes on that Dorothy reckons the Neighbourhood Watch thing is meant to be a community effort: they ought to at least have a talk about all the breaches of security. Madge just snaps that he can do what he likes. With that, she and Helen head off. GEMMA: How did we end up here?! Matt tells her that Madge will probably be home soon; he'd better go. They just resume kissing, though! MADGE: If that woman knows what's good for her, she'll lock her own door, or I might take after her with an axe! With that, she heads off to Gemma's bedroom, saying the poor kid could do with a break. Gemma and Matt are still lying on the bed, kissing, when Madge knocks on the door. Matt runs and hides behind the door, so that Madge can't see him when she then opens it and peers into the room. Finding Gemma lying on the bed, she asks if she woke her. GEMMA: Yeah... I was reading. I guess I must have fallen asleep. Madge goes and sits down with her on the bed, commenting that, with all this studying she must be exhausted. She suggests that Gemma come and have a cuppa. She stands up and goes to head out of the room again – but she then spots Matt hiding behind the door. MADGE (angrily): Matt! What the hell are *you* doing here? Melissa and Todd are sitting at a table. Melissa tells Todd that Josh feels bad about accusing him. Todd retorts that so he should. Cody comes in and Todd excitedly shows her some new trainers he's bought. He tells the girls that they cost $190. He then asks Cody where she's been. CODY: Hot on the trail of the phantom kisser! Melissa asks if she's found the shirt. Cody, however, admits that the button was a bit of a red herring, as it's the standard button on all school and cricket shirts. MELISSA: So how do we find out who it is? CODY: With Inspector Cody on the case, all is not lost. CODY: These are the names of the boys playing tennis or cricket while you [she looks at Melissa] were being plagued by the phantom. She holds up another sheet of paper. CODY: And these are the names of the guys who were absent from sport that day. Any one of those could have been in the darkroom. CODY: I've eliminated the boys' names that didn't match the height and weight descriptions that Melissa gave me. Six names: one of these is the phantom. CODY: That's it, then: our phantom's over at that table. She indicates the other side of the Coffee Shop. CODY: All right, so he's the shyest guy in school. You obviously *do* something to him! MELISSA (snaps): I haven't done anything to anyone! 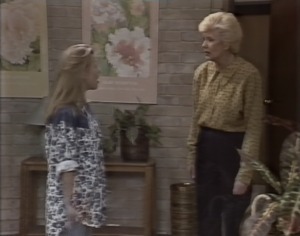 CODY: Who would have thought Rodney Feldon had the guts to corner a girl in the darkroom?! MELISSA: I don't call it guts; it's creepy. Still... I wonder where he learnt to kiss like that?! Cody suggests that Melissa tell him what a great kisser he is, and boost his morale. CODY: Think of it as your duty to womankind. A talent like Rodney's mustn't be hidden! Madge and Gemma emerge from Gemma's bedroom, Madge demanding to know how many other times Gemma has had Matt stashed in her room while she's supposed to have been studying. Gemma retorts that it's never happened before. MADGE: You promised you wouldn't see Matt until the end of the exams. This was a deliberate attempt to deceive me. MADGE: Gemma, you have proven to me time and time again that you can't be trusted. Now I've told you before: if you're going to live under my roof, you abide by my rules or get out. GEMMA: All right, then. I will. She heads for the door. GEMMA: Anything will be better than *this*. With that she marches off, slamming the door behind her. Rodney is at the house with Cody and Melissa. Cody manages to get them to sit down next to each other on the couch. She puts some music on and then goes to get some drinks. Melissa rushes over to the kitchen area. MELISSA: Cody, this is not a good idea. I mean, what am I supposed to say to him? CODY: Look, the boy has a problem. He can't harness it by hiding in the dark. It's up to you to sit him down and give him a good talking to. MELISSA: I do not appreciate being grabbed in the dark. CODY: Exactly. That's why it's up to you to set him straight before he turns into an all-time darkroom creep! Melissa points out that Josh will freak if he finds out. CODY (shrugging): Years from now, you'll look back upon this as a time when you showed a confused boy the pathway to manhood! CODY: Don't damage those lips of yours: they're your best feature. She then announces that she's off to the shops. Melissa pleads with her not to go, but Cody ignores her. Melissa turns to Rodney and smiles at him warily! Helen is sitting on the couch, drawing, and Jim is sitting at the desk, working, when Todd walks in, covered in cuts and bruises. Looking shocked, Helen rushes over to him and asks in concern what happened. Todd explains that he got mugged on the way home from the Coffee Shop: a gang of older guys jumped him. Jim leads him into the kitchen, where Helen gets the first-aid kit. JIM: Did they take your wallet or anything? They must have wanted *something*. He then notices that Todd's feet are bare. JIM: Where are your shoes? HELEN (incredulously): You were bashed for a pair of school shoes? TODD (sighs): No, I was wearing my new runners. Jim tells him that it's not worth risking his life for $70. TODD: I used the rest of my savings, as well as money you gave me. JIM: What possessed you to spend that much? TODD: All the other kids have got them. JIM: So if all the other kids had an extra hole in their head, would you want one of those too? TODD: Uncle Jim, it's trendy. JIM: Black lace-ups from now on, mate – and I'd like a full description of the thugs. Helen starts tending to Todd's wounds. Melissa and Rodney are making smalltalk on the couch, Rodney saying that he likes the trifle! Cody arrives back home and heads to the kitchen area. Melissa joins her. MELISSA: Rodney's fine. I gave him some good tips. RODNEY: I can't think you enough, Melissa. RODNEY: No, it was really something. I feel much better about... well, thank you. Bye! He goes to head off, but bumps into Doug at the doorway. Looking embarrassed, he rushes out of the house! GEMMA: Who does she think she is? She's getting as bad as Mrs. Burke. MATT: Gemma, calm down, OK? GEMMA: I don't *want* to calm down. I'm upset. This is just what I need in the middle of my exams. MATT: She wasn't serious about you moving out, was she? You were arguing. GEMMA: We're *always* arguing, Matt – that's the problem. This is a very important time for me and she's turning it into a nightmare. What's the bet she's on the ‘phone right this minute to dad, trying to get me sent back to Brisbane? MATT (sighs): She's *not* on the ‘phone to your father. They want you to finish your school year here, right? 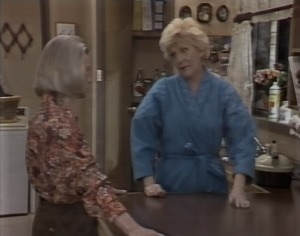 GEMMA: Until I can get a job and some money, I'm stuck here in Ramsay Street; I'm stuck with Aunty Madge. Matt, looking thoughtful, tells her that he's got two jobs - one at the garage and one at the Waterhole – and he's pretty sure they could survive on what he earns until she gets herself a job. GEMMA (looking astonished): Us? Live together? Seriously? MATT: Yes! I'm game if you are. It's night-time. Jim and Helen are giving Todd a lecture about how young people want instant gratification these days. Jim asks Todd how come he went ahead and bought the trainers if he knew about the attacks. Todd replies that he doesn't think it's happened in Erinsborough before. Jim asks him if he tried to defend himself. Todd nods that he did, but there were too many of them. Jim tells him that he could do with some boxing lessons. HELEN (aghast): Absolutely not! Boxing's too brutal. JIM: He's got to learn to defend himself, Helen – and boxing's an admirable sport; an honourable sport. He tells Todd to have a look at what defence classes are available. The next day, Rodney is sitting with a mate when Melissa, Cody and Josh walk in. Josh suggests to Rodney that they work on that science project this weekend. He adds that he's sorry he had to walk out on him yesterday. CODY (looking surprised): When were you working with Rodney? JOSH: Not long before I caught up with you in the darkroom. Cody and Melissa look at each other. CODY (quietly): Then it couldn't have been Rodney, if he was working with Josh. CODY: Justin... how was cricket practice? CODY: What did he say? MELISSA: It's him! He's the phantom kisser! Helen is standing in the kitchen. Madge yawns as she puts the kettle on. Helen asks her if she's ill, but Madge explains that she's hardly slept, worrying about this business with Gemma. She adds that the girl sulked in her room all evening. MADGE (sighing): I try to do the right thing and all I've succeeded in doing is alienating Gemma right at the time when she needs all the support she can get, during her exams. Seems I'm turning out to be the world's worst aunt as well as a pretty cruddy mother. HELEN: Oh Madge, you're too hard on yourself. I know you have Gemma's best interests at heart; it's not easy looking after an adolescent. MADGE: Don't I know! I mean, Charlene was no picnic either, but I have handled this whole thing between Gemma and Matt so badly. HELEN: You are doing your best. 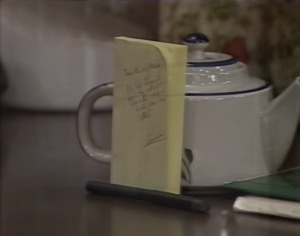 She suddenly spots a folded sheet of paper resting against the sugar bowl. She picks it up and reads it. HELEN: What does it say? MADGE (looking upset): She's left; she's found another place to live. HELEN: When did she go away? MADGE: After Harold left for work, I suppose. No, Helen, this is ridiculous. It's got to be a joke: she hasn't got a cent to her name. With that, she heads to Gemma's room and opens the door. She finds the room empty, though. Standing in the doorway, tears well-up in her eyes and a distressed look crosses her face.